Alpha Beta® Glow Pad for Body is the only exfoliating and anti-aging self-tanner with Active Vitamin D that firms,smoothes bumpy skin and helps reduce hair growth. This unique formula is delivered through a textured towel toenhance body exfoliation and increase cell turnover while Active Vitamin D provides a natural glow. Capislow™ helps reduceshaving frequency by minimizing hair texture, length and growth. AHAs tackle bumpy skin (Keratosis Pilaris) for a smooth,even application while naturally-derived BHAs address body acne and breakouts. 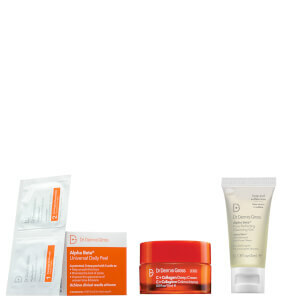 Microencapsulated DHA and Soy Proteinsdeliver color deep into skin to prevent fading. Discover all the benefits of a bonified body treatment, while achieving anatural-looking, streak-free tan. Provides natural glow with Active Vitamin D.
Firms with potent Antioxidants & Caffeine. Helps minimize shaving frequency with Capislow™. Open towel & apply to body in circular motions, blending evenly until dry. Wash hands immediately after use. For best results, follow with moisturizer. Color begins to develop within 1 hour of application. Apply 2-3 times weekly to maintain color & maximize results. This is awful - the application is easy enough & virtually mess free but the results are less than desirable. I would never recommend this - it does not exfoliate at all and any freckles, dark spots etc., especially on your legs, just get darker making you look like you have some sort of rash or disease. Really a shame for the price paid. I am still looking for that "almost perfect" self tanner. Application is easy and I get results quit fast, but I can still "smell" that chemical. It is very faint, but it still bothers me the first 2 days. A bit on the expensive side for only 8 uses. Color goes on evenly, (I moisturize right afterwards)and looks very natural. Easy to use!